I know, I know, I’ve been so absent. My blogging mojo is kicking me where it hurts, but I can’t seem to find my blogging muse. So, for now, today, I found a reason to return. This refers to the ranch matriarch in my book series. In this series, Judy Carlson has been a widow for many years. Some of you are wondering if I’ll write my ranch matriarch’s book. Yes! Absolutely. I am writing it. In fact, I have nearly thirty-three thousand words written, which turns out to be eighty-five pages, so far. Remember, I write real-life situations. Expect this book to have multiple points of view. If you know the series, then you know her boys will not take the sidelines if another book is coming out. Oh, no. They have a lot to tell about their lives, too. In the interim, kids have grown, hormones, both pregnancy and menopausal, have run rampant, babies have been born, and lost, but they keep on keeping on the close-knit Carlson way. Now, let’s prepare for Judy’s story later in 2019, which picks up two years after Lassoing the Last Dance. WARNING: If you haven’t read the series, this snippet contains SPOILERS. I’m sorry, but if you read this, you could forget them unless you start reading book one right away. None of my books have cliffhanger endings, and if you choose to read only one book, you will still have a complete story in itself. Always. Judy Carlson got up from the stool in her middle son’s kitchen and strode to the window in the great room. Her oldest granddaughter, Destiny, had added more blush to what she’d already plastered on Judy’s cheeks. Nora still fiddled with her hair and after she’d brushed her hands through it to soften the areas from too much spray. “You two had numerous dances at the party the night you met. He already liked you. This is a date, nothing more,” Nora chided. Newcomer to the series? Well, let me tell you, Cowboy Boss and His Destiny is book #1 with Tristan, the middle son. Judy’s book will be #5 so get busy reading while I’m writing. 🙂 I wrote a spin off to this series where the Carlsons also appear. Readers, thanks so much for your interest in upcoming books in this and the spin off series. If you loved the Double Dutch Ranch Series and the spin off, I hope you’ll love my new series as much. I sure do. I’m crazy about the new characters I’ve created. Have you ever been to Sedona, Arizona? This area plays a big part in the new one, but the main setting is north of there toward the Grand Canyon. If you’ve been following my TITLE dilemma with this book, I’m proud to announce I have a title! Oh, come on. You know I don’t release titles this early. I recently posted on Facebook on both my regular profile and author page, that, yes, I have a title after letting the book sit a couple weeks. I went back to it a fifth or one-hundredth time to do another revision/edit, and out of the blue, my hero gave me the title. The guy lived in my heard for a year, and it took him this long to reveal it to me–the cocky cowboy that he is. Humph. 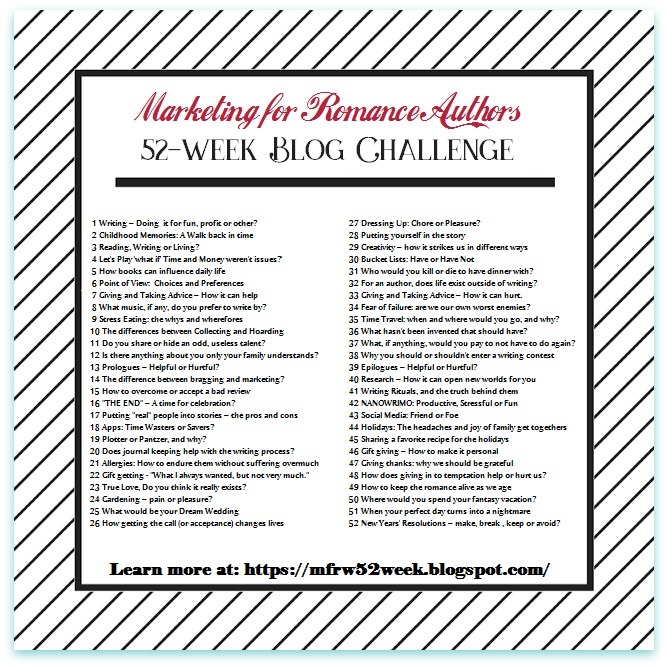 I missed another 52-Week Blog Challenge Friday even after writing a draft post. It didn’t feel like what I really wanted to say about overcoming and accepting bad reviews. I’ve had to do both, so I let the post sit in draft and ignored another week. Albeit, as you can see, I have been busy writing books, and I took this week to clean my apartment between revisions. It’s another one of those necessities even writers can’t ignore. I suppose this includes laundry? I won’t tell you how many up-and-down-the-stairs trips I made to the washer and dryer or how much it cost me. Nope, I will not tell you. Until the next time… Be good to yourself.